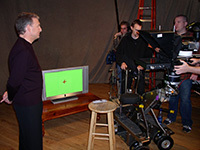 Through-The-Lens teleprompter systems can be rigged easily from crane and jib arms. 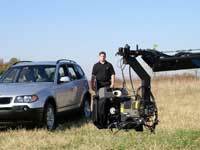 In this shot, BMW’s Hunter Buckner prepares for another “take” where the jib arm will move towards him from a wide establishing shot into a midshot of him. All of Tennessee Prompters’ through-the-lens displays can be mounted and used on a jib arm or a rolling Dolly, just as easily as on a tripod. Plus, we have extra extension rails for our displays to accommodate large lenses, such as the 24 pound, 30 inch long Optimo 24mm to 290mm zoom lens. 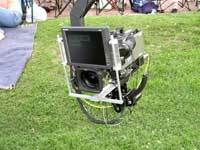 Not all teleprompter monitor systems are designed for through-the-lens use. For A&E’s live network broadcast of Nashville’s 2003 Fourth of July celebration, Tennessee Prompters used this lightweight 12” Marshall Flat Screen Over-The-Lens system.